Time Magazine in its June 6, 1983 issue calls stress “America’s No. 1 Health Problem.” Fast forward 26 years and the problem of stress is still plaguing the United States and doesn’t show signs of giving way anytime soon. With the scarcity of funds and negative economic indicators it is no wonder the American Psychology Association states that 73% of Americans name money as the number one factor that affects their stress level according to a 2004 APA survey. Couple that fact with the leading source of stress being “job stress” and with one directly affecting the other we can draw the conclusion that anxiety and stress are quickly becoming the psychological staple of the American family. It will be the intent of this paper to ascertain the causes, effects and strategies for coping with contemporary stress in our lives. The primary reason for specifying “contemporary” stress is that stress has become more pervasive and insidious as decades unfold and each generation is presented with unique challenges from a psychological perspective that can drastically differ from their predecessors. We will be defining stress, discussing the types and various sources of stress. A large portion of this article will be devoted to the importance of coping with stress as well some modern strategies for dealing with stress. Lastly, the author will share the results of a personal stress assessment and his intentions on implementing some coping skills learned from the research for this article. From an externally identifiable source there have been attempts to identify the top ten stressful events in an individual’s life as follows: Death of a spouse, Divorce, Marital separation, Jail term or death of a close family member, Personal injury or illness, Marriage, Loss of a job due to termination, Marital reconciliation or retirement, Pregnancy and Changes in financial state. The causes of stress largely depend on the individual and their ability to adapt and or their genetic pre-disposition to dealing with or coping with stressful situations. These stressful situations can range from births, deaths, reunions, to weddings. Personal relationships are a constant source of contention and stress as well, as an individual is called upon to balance the responsibilities of work and project deadlines and quality time with the family. More time at work could mean less time with one’s family while more time with one’s family and less time at work could add economic stress. From a medical perspective stress has deadly consequences. As our bodies attempt to maintain the state of homeostasis, the ability or tendency of an organism or cell to maintain internal equilibrium by adjusting its physiological processes (American Heritage Dictionary), stress sets in motion a series of chemical and hormonal changes that make homeostasis difficult. The survival instinct that is purported to be genetically implanted in our DNA (Deoxyribonucleic acid) is called “fight or flight.” This condition causes the following biological responses to take place, A) Heart rate and blood pressure increases the flow of blood to the brain to improve decision making B) Blood sugar rises to produce more fuel for energy. As a result there is a breakdown of glycogen, fat and protein stores C) Blood is diverted from the digestive tract where it is not needed for digestion and sent to the large muscles of the arms and legs to provide more strength in combat (fight), greater speed in retreating (flight) from the scene of danger D) Clotting takes place more rapidly to prevent excessive blood loss from cuts, scrapes or internal hemorrhaging. The endocrine system plays a vital role in “fight or flight” by setting in motion a cocktail of hormones including adrenaline, cortisol and other stress-related hormones. These internal mechanisms are intended as life saving measures to facilitate our ability to deal with physical dangers. With our sedentary lifestyles and lack of perilous situations on an ongoing basis our bodies are still prone to this “fight or flight” response in stressful situations. Repeatedly activated without the outlet of escaping the perils of the “fight or flight” we are at greater risk for a host of medical conditions that include hypertension, strokes, heart attacks, diabetes, ulcers, neck or lower back pain, to name a few. 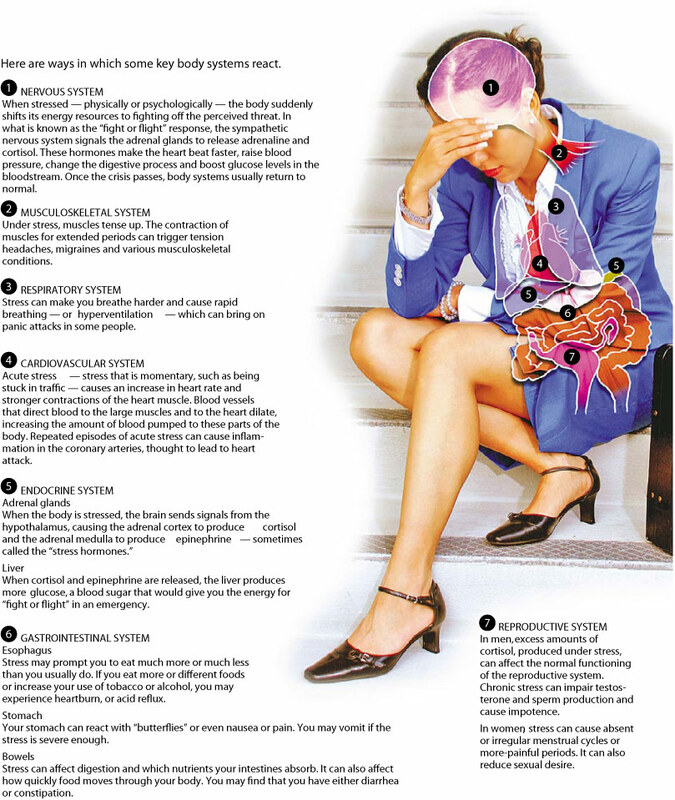 For a pictoral of the medical effects of stress from the Washington Post click HERE. Now that factors leading to stress have been identified a very important element in the discussion of stress that will be covered is coping. As there are a variety of sources and causes of stress so too are the strategies for coping. There were some intriguing findings in the Journal of Personality and Social Psychology. This article assesses how people cope with stress based on five scales with four items each that measure distinct aspects of problem-focused coping (active coping, planning, suppression of competing activities, restraint coping, seeking of instrumental social support). Within the scale there are two general ways in which people cope with stress. First is problem-focused coping which can be described as problem solving or doing something to alter the source of the stress. This method is often exercised when it is believed that something constructive can be done to eliminate or reduce the stress. Problem-focused coping has unique properties in that is centers on planning, taking direct action, seeking assistance, screening out other activities, and forcing oneself to wait before acting. Secondly, is emotion-focused coping that centers around reducing or managing the emotional distress that is associated with the situation. This method is predominately used when people feel that the stressor is something that must be endured. Emotion-focused coping typically revolves around denial, others embrace a positive reinterpretation of stressful events and still others involve seeking out social support. As we delve deeper into the coping aspect of a sub-element of problem-focused coping we find Active Coping. Active coping is a process in which steps are taken to remove or circumvent the stressor or to at least minimize its effects. Just as the name implies this style of coping tends to involve direct action on the part of the individual coping with the stress by increasing one’s efforts or involvement in an attempt to reduce or eliminate the source of stress. Also under the umbrella of problem-focused coping is Planning. Planning is thinking or dwelling on how to cope with a stressor. An additional element of problem-focused coping is Suppression of competing activities. This enables the individual who is attempting to cope to avoid dealing with competing and conflicting events that will enable them to better focus on dealing with the stressor. Restraint coping involves the individual waiting until the appropriate opportunity. This requires that an individual would be holding back and deferring any action until either they are better equipped to handle the stress or if acting prematurely would simply aggravate the situation further. The last element, Seeking social support, is the process of seeking out advice or assistance in coping with stress. Essentially, this is seeking “moral support” or seeking knowledge and understanding about the source of the stress. Other more traditional methods for coping with stress include the following; medication, stress management programs, behavioral approaches, massage, cognitive therapy and mediation. A high level of stress puts you at increased risk of serious health consequences, including obesity, heart disease and depression. Take steps to lower your level now. Stress is what you experience when the level of your stressors exceeds your ability to cope. To lower your stress level, you have two options. You can start by identifying sources of stress that you can eliminate. Consider internal stressors, such as fears or unrealistic expectations, as well as external stressors, such as family or work demands. Next, seek out effective strategies for coping with stress, including exercise, painting, humor or simply saying no. If you need help identifying stress management strategies, talk to your health care provider.